Birmingham Review "If I owned this city, i'd make it behave"
On Saturday 28th April, Birmingham’s party collective Opulence launch their brand new night, Mother’s Meeting. In honour of the inaugural event, Opulence are bringing avant garde queen and Instagram darling Charity Kase to Birmingham, for a night of performance at Bar Jester on the Queensway in Birmingham City Centre. Doors open for Opulence Presents Mother’s Meeting at Bar Jester from 9pm, with performers scheduled to go on stage from 10pm. Tickets are priced at £4 (adv) and £4 (otd) – for direct event information and links to online ticket sales, click here. London based artist Charity Kase gained recognition when they carried out the ‘365 Days of Drag’ challenge, a feat that won Kase the Queen of the U.K 2017 Award through WERRRK.COM. This saw the 21-year-old art student produce a new look every day for a year. The completed gallery can be found on their website, where looks inspired by horror films and children’s toys nestle alongside the abstract and the political. Each character comes with their own snippet of a story, which could be a taste of what live audiences can expect at Mother’s Meeting. Kase’s art also spills over into their own DIY clothing label, Upperkase. As part of their mission to showcase Birmingham’s diverse drag culture, Opulence have laid on an impressive line-up of support acts. Opulence’s own Jay Andre, Dahliah Rivers, Jenna Davinci, Yshee Black and Nora Virus will also be taking the stage, while Elliot Barnicle will be serving up his bold, graphic looks from the DJ booth. Altogether, the Mother’s Meeting crowd can expect another fresh addition to Birmingham’s burgeoning drag scene. 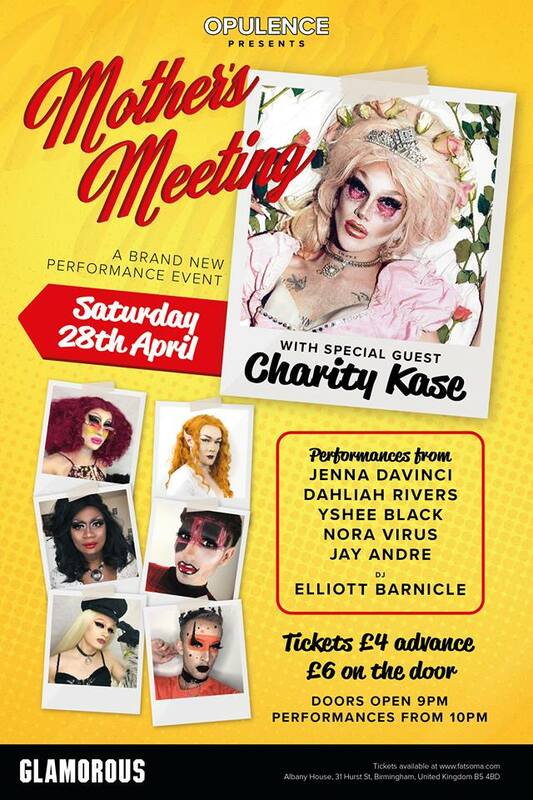 Opulence Presents Mother’s Meeting at Bar Jester on Saturday 28th April, with Charity Kase as the headline act – joined by a troupe of Opulence’s own performers. For direct event info and links to online ticket sales, click here.